Pedals are guaranteed to take a beating, so there's no point in getting some fancy carbon-infused unobtanium platforms that'll disintegrate after three rock strikes. 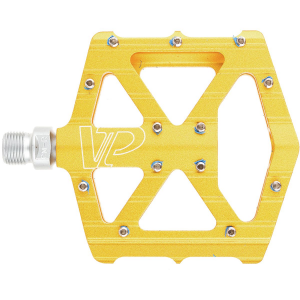 VP Components' VP-001 Pedal is burly, lightweight, and straightforward, so you can ride hard, bash rocks, and do it again tomorrow. They're machined from CNC aluminum, with an extra-wide platform and 12 replaceable pins for top-shelf grip, and each pair weighs just 345g, so they won't slow you down. The VP-001 spins around a forged cromoly axle with sealed bearings that won't accumulate dirt and grime, and you can also buy VP's rebuild kit if you want to freshen up your pedals so they ride like new.